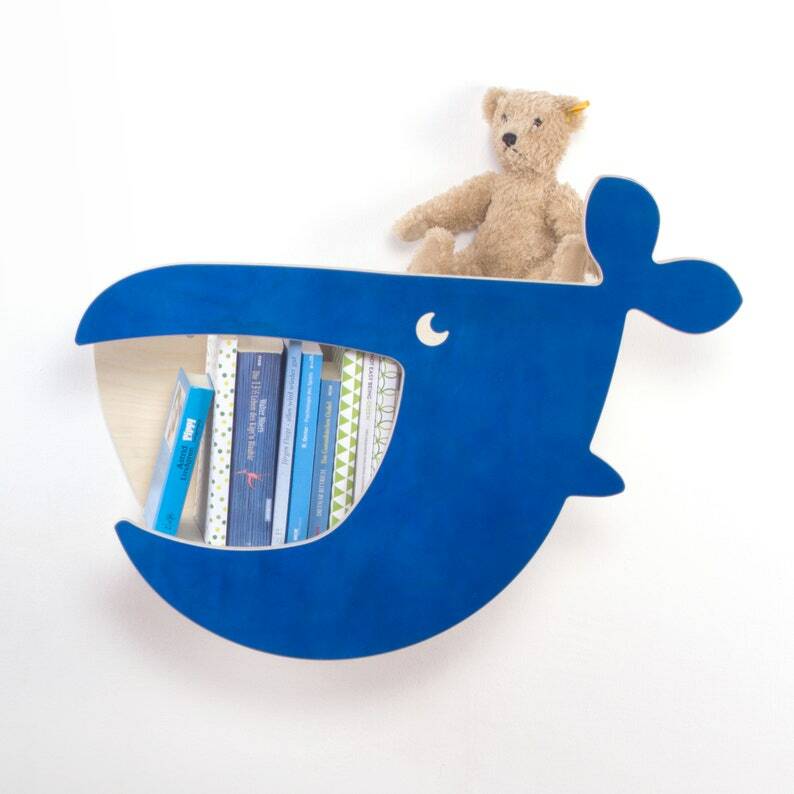 A very special bookshelf for children is Wal Moby. It is not only a decorative eye-catcher in the nursery, but also helps the little ones to clean up. They are allowed to feed him, that is, put the children's books in his mouth. Books and toys always find their place on the child-friendly wall shelf in simple and timeless design. The bookshelf for hanging is ideal as a small shelf next to the bed or as storage space above the desk. So the kids always have their favorite books at hand. Due to the special shape of the shelf, the books remain upright and cannot fall out. Cleaning up is often a painful issue between parents and children. Wal Moby, a bookshelf for children, likes to help. Playfully, the children are introduced to the tidying up through him. You are allowed to feed the good-natured whale with books and toys. So Moby is a real friend and helper in the nursery. Due to its timeless, simple and child-friendly design, it is also a beautiful decoration in every nursery. The children's shelf is delivered with assembly instructions in individual parts. In a few steps it is simply constructed and quickly attached to the wall. The maximum resilience is 10kg, depending on the wall condition and type of attachment. The children's shelf is made from high-quality birch coating wood with a robust melamine coating. We source this from a Swedish manufacturer whose plates are specifically approved for children's toys and who uses wood from sustainable forestry. Sustainability is our top priority. We pay attention to the use of high-quality and renewable materials. The production of the children's room shelves takes place exclusively in Germany. Thus, we guarantee fair working conditions, high production standards, short transport routes, quality and longevity of our products. The shelf is delivered disassembled. The 5 parts are easy to assemble with the help of the assembly instructions. über die Internetplattform etsy schließen. Soweit nicht anders vereinbart, wird der Einbeziehung gegebenenfalls von Ihnen verwendeter eigener Bedingungen widersprochen.